When a child is diagnosed with a brain tumor, mom is there keeping her family together in the face of adversity and fear. Through diagnosis, treatment and hospital stays, she wipes away her child’s tears, while fighting back her own. She would do whatever it takes to provide her child a healthy, happy future. 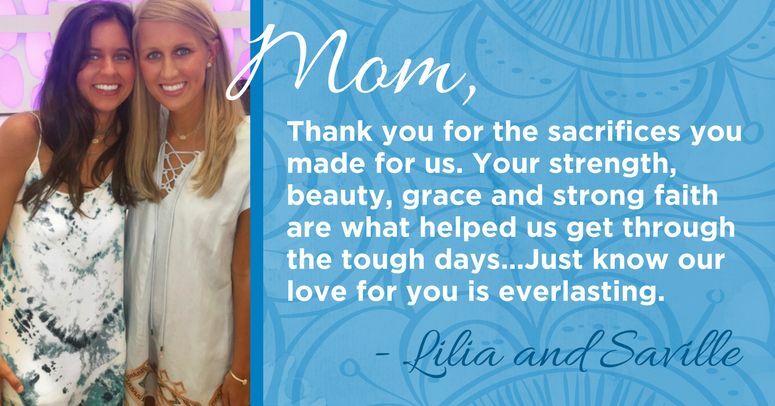 This Mother’s Day, we want all women who care for our Stars to know how appreciated they are. We see their super-human strength, perseverance and endless love for their children. And their children see it too. Lilia and Saville are close-knit sisters, just a few years apart in age and separated only by distance as they attend the University of Georgia and the University of Alabama. When Lilia was diagnosed with an astrocytoma at age 16, Saville was by her side. Then the unthinkable happened — within a month, Saville was diagnosed with medulloblastoma at age 19. No mom should ever have to experience a child’s brain tumor diagnosis. Give hope to these families by donating in honor or memory of mom and the other amazing women in your life. Choose from one of our Mother's Day e-cards featuring artwork by children with brain tumors to help tell her you care. We also invite all of our Star and Eternal Star families to tell mom how much she means to them. Share your note of thanks, photos or videos on Instagram, Facebook and Twitter with the hashtags #CareCureThrive and #MothersDay. As the world's leading nonprofit dedicated to children and teens with brain tumors, the PBTF's mission is to care for families along their journey, cure all childhood brain tumors, and help survivors and families thrive. Join us in this mission by giving a Mother's Day gift that will make a difference.